The entry is an open area, with no front closet or storage, and it’s separated from the living room by the brick fireplace. To the left, as you enter the home, there is a hallway — and you may remember, that we transformed that hallway with cubbies and hooks to help with the non-storage in the entry. 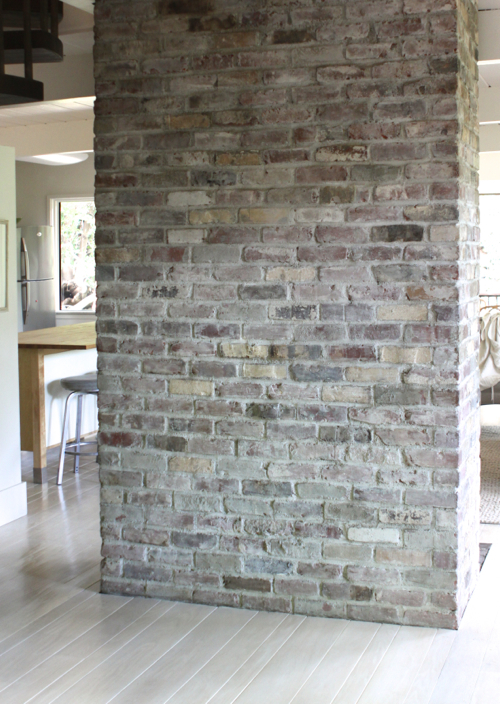 We also replaced/refinished the floors in the whole area, and whitewashed the brick fireplace with milk paint. At that point the entry was bright and clean and simple and we’ve kept it that way pretty much ever since. But it’s a big enough space that I knew I wanted to do something more with it. So from time to time I’ve experimented. 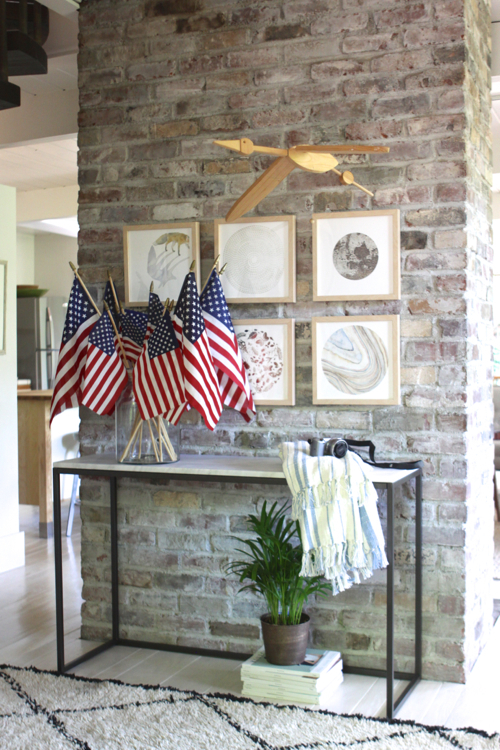 At one point, I tried a little love seat in front of the bricks, and when I wanted a holiday display in the entry, I would roll the hallway cubbies in and cover them with a tablecloth to act as a temporary console table. Though, really, it’s mostly been empty and waiting patiently for some attention. First, I added a rug. It’s a rug that my sister Jordan picked up on a trip to Morocco and used in her apartment in Paris. I’ve tried the rug in the girls room too. I don’t know if it’s quite the right thing for this space, but I’m testing it out. I like the look here, but may need something more durable with all the foot traffic — I’m thinking I might want to go with a Dash & Albert indoor/outdoor rope rug — they can be scrubbed and hosed down! For a table, I wanted something versatile that could display holiday or seasonal decor sometimes, but also function as a desk when needed. I chose this one from West Elm. It has a marble top, but you can also get it with a wood top or a glass top. I though the marble would be a nice mirror of the marble coffee table that resides on the other side of the fireplace. Once the table and rug were in place, I turned my attention to artwork. I wanted something neutral that would fit well with the other pale surfaces we have going on in this space, and that I could put other colors nearby or in front of without causing problems. I picked artwork from Minted and went with a circle-in-a-square theme, and stuck with neutral colors. We ended up choosing Natural, Mineral 03, Surround Me, Moon Rock, Fox Shadow, and Under The Microscope. To finish things off, I chose a natural wood frame to mesh with our “treehouse” vibe. Here’s a shot of the “before” entry, taken from the front porch. 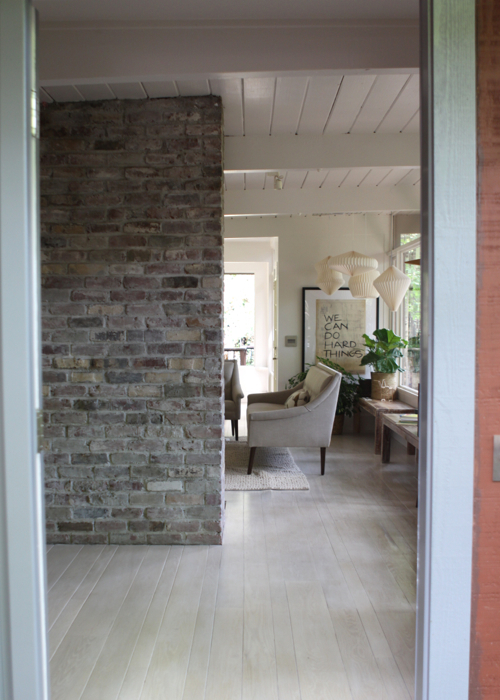 You can see new floors and the whitewashed brick fireplace. Here’s another before shot so you can see how the fireplace fits in to the overall space. 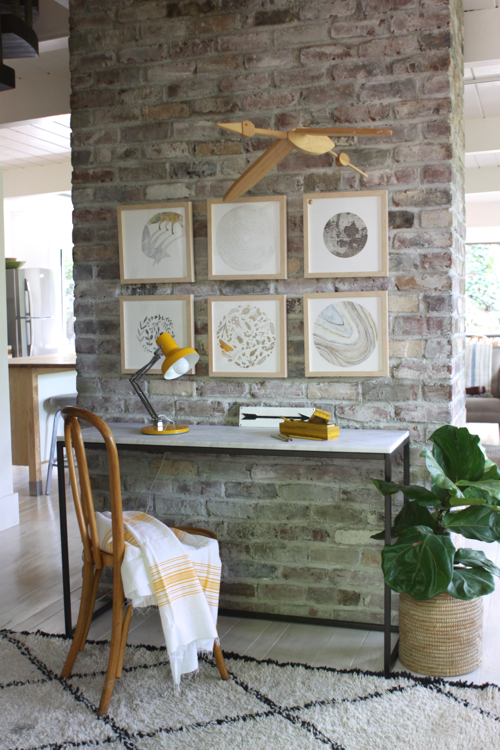 Once the basics were in place — the rug, table, and artwork — I started experimenting. I styled the area three different ways with objects from around the house to see if it was as flexible as I’d hoped. And it was! 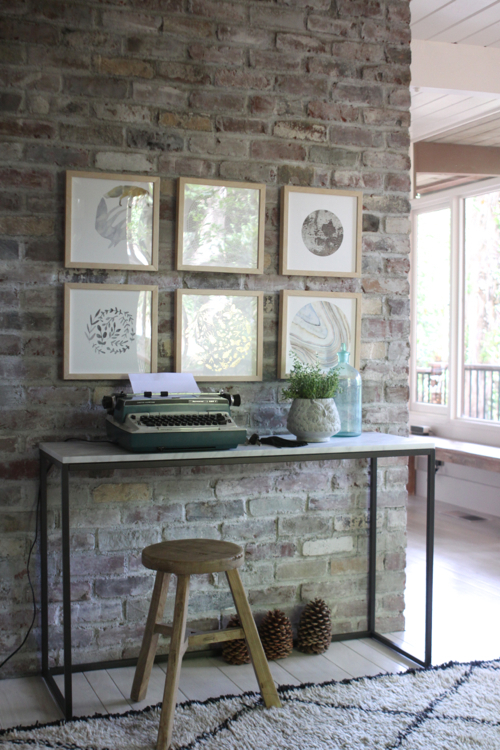 First, I tried it with Maude’s typewriter to see how it worked as a desk. I really liked how this turned out and I think this is the default styling I’ll use for now. Next, I tried it with some golden yellows. I wanted to see if it was easy to refresh if I’m in the mood for a change. I love how the yellows warm it up. Last, I tried it with some flags to see how seasonal decor might work. Charming, right? What do you think? Do you like how it turned out? Do you have a favorite of the 3 looks? I’m also curious: Decor-wise, do you like to mix things up in your house seasonally or for the holidays? Or do you prefer to put everything in place and then call it good? P.S. — You can find all the Treehouse posts here. Great use of space. 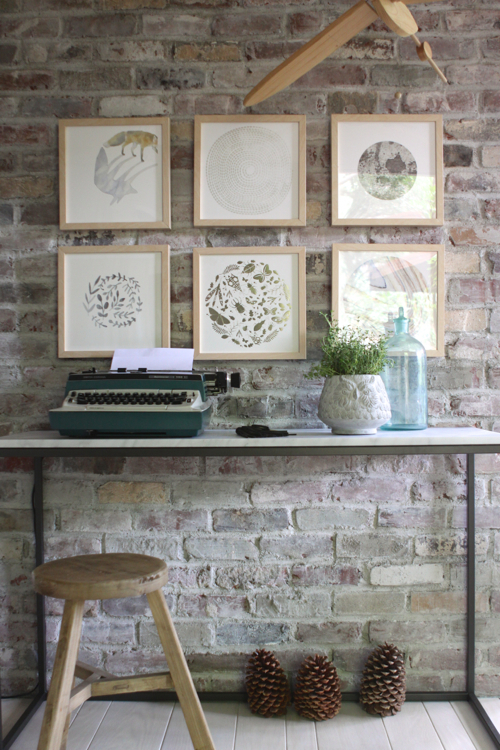 I like the contrast of the circles against the linear bricks, desk and rug. Did you order your West Elm piece online or did you choose it in store? Thanks for including your thought process on choosing the artwork- sometimes all the choices are overwhelming for me. Hi Michele! I picked up the table in store. Though I believe the wood-topped version is online only. So glad you liked hearing my thought process! 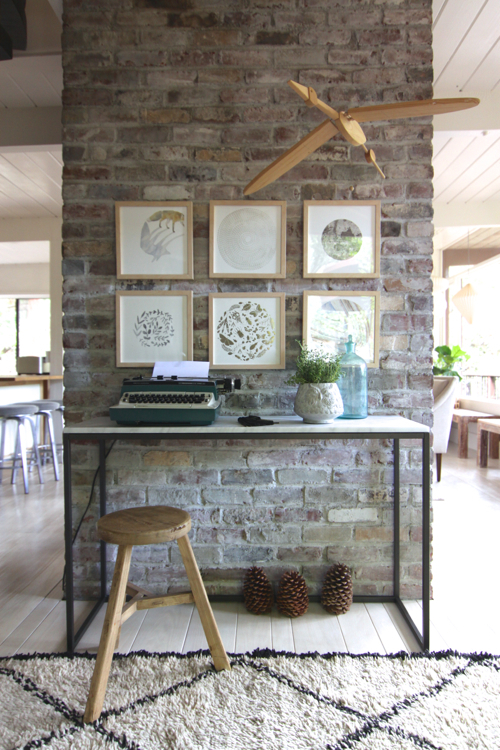 I dig it…I love how versatile it is with the console table and art both being rather neutral. My fav. is the typewriter look, but really all three are great. Especially like the idea of doing seasonal decor–something I’m not that great at. So, A+ from me. I think the typewriter look is my favorite of these as well. And the typewriter is irresistible to visitors — especially kids. i am exceptionally bad at re-decorating. once it’s done it’s done. for a long time! For me, it’s a room-by-room thing. Some rooms are done and I don’t think of redecorating for years, and other spaces I like to shake up a bit. Looks great! Where did you get the We Can Do Hard Things print in the background? Thanks, Candace! I actually made that print. The DIY is in my book. But the directions are really simple. I used an old blueprint of our home that we found when we moved in, and then I used basic acrylic paint and a simple brush to write the words. I love that print as well! It’s high time to get your book, so I’ll dig for the DIY inspiration there. Hello! I love your blog and book. Can you tell me where you found the hanging wooden bird? It is so sweet. Thanks! Thanks for the kind words, Kelley! Good question on the bird — I should have known to mention the source since it’s in all 3 versions. : ) We actually bought it 18 years ago when I was pregnant with our oldest, Ralph. We were living and working in Athens, Greece, and we ended up spending a couple of weeks backpacking around Europe. We found the bird in a little wooden toyshop in Prague. We gave it as a baby gift to my sister to hang over the crib — when you pull the little wooden bead on the string, the bird “flies”. It’s really calming and lovely to watch. When my sister was done with the baby stage, she gifted it back to us. I was so delighted! 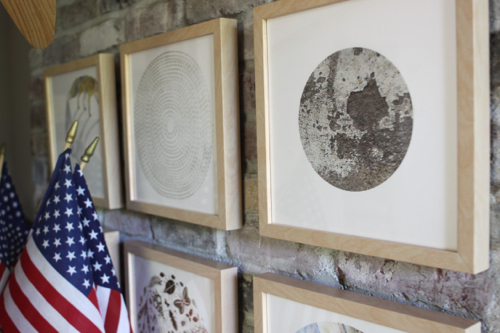 We keep it in the living room — it’s a fun way to greet visitors. Anyway, back to your question. We’ve looked for an online source for the bird and we’ve come close. The shop we bought it in also made these little elephants that walk down a ramp. (Which are super adorable by the way!) We’ve since found a source for the elephants online, but are still looking for the bird. I typically try searches like “wooden crane hanging toy”. Here’s a link that shows a similar one. If anyone else has seen these for sale, please feel free to share the link! gorgeous! I love the one with the yellow accents….i love the way it pops off the neutral colors. Your entry is so lovely! We just moved into a wonderful new (to us) home, but we are in desperate need of artwork. This would be perfect! It works! Three different styles in one space and each looked great. 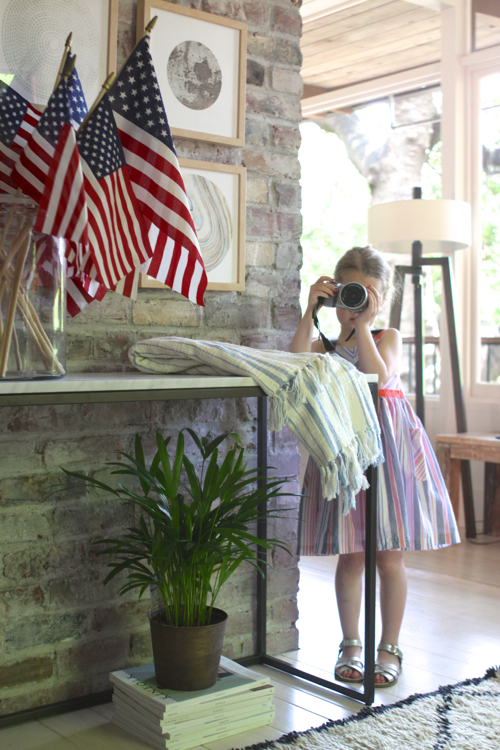 Do you mind sharing the brand and model of camera your daughter is holding in the 5th to last photograph? Thank you. Happy to share, Gee! It’s a Sony NEX-5TL. I wrote more about it here. It’s my favorite travel camera because it’s so lightweight and you can transfer images to your phone on the run. All my images from our Sweden trip last summer were taken with this camera. I found this in hanging wooden bird on etsy. That’s gorgeous, Ines! Thanks for the link. I love the painted details. I love it!! So clean and simple, but also really pretty. I’m a sucker for yellow, so that one’s my favorite, but I also love it with the typewriter and greens. I love all the ways you decorated this space! 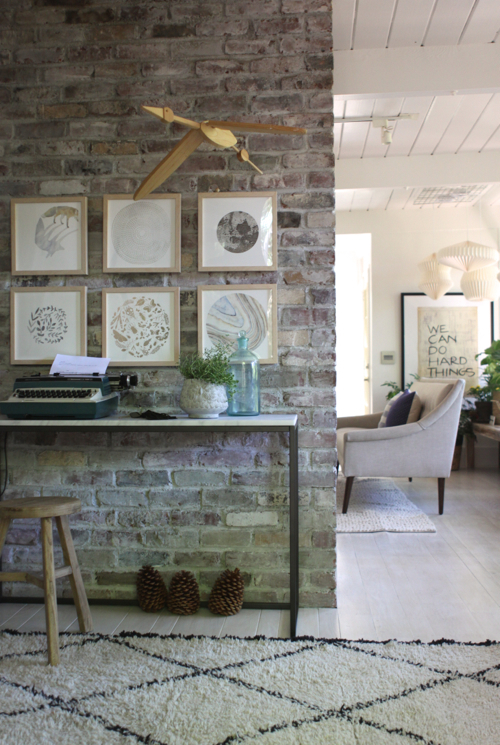 that exposed brick is so gorgeous though that I’m sure anything you did with the space would look amazing! I love Minted! I did the custom art work for holiday gifts this year. I’d love to get a really big piece of art for our family room wall, so thanks for letting us now about the contest! Looking forward to a post about France…hint hint! 1. Where did you get the large frame for your “We can do hard things” artwork? 2. How do you feel about working religious artwork into your home? My style is kind of modern/whimsical/ish and the more serious religious pieces I love just clash with everything else. Thoughts? Hi Kimber! We actually already owned the large frame before I made the We Can Do Hard Things print. Does Framebridge offer oversize framing? I’ve worked with them before and they are an excellent source — you can send them your original artwork via mail and they’ll frame it at great prices. I’m all for hanging art in your house that you love! If you love religious art, that’s terrific. I think you’re right that lots of religious art is serious looking and less whimsical. Though I feel like options are expanding — sometimes I’ll see religious stuff pop up on Etsy that reflect current design trends beautifully. 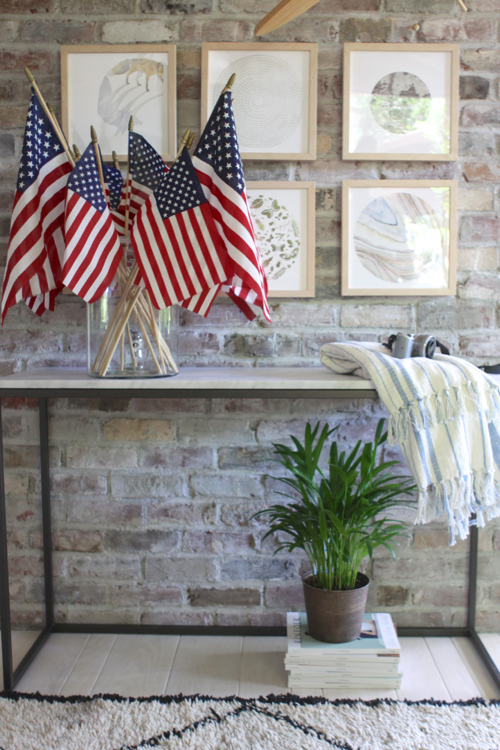 I love the flag display, so much so, that I went right out and bought a dozen flags for my own display! 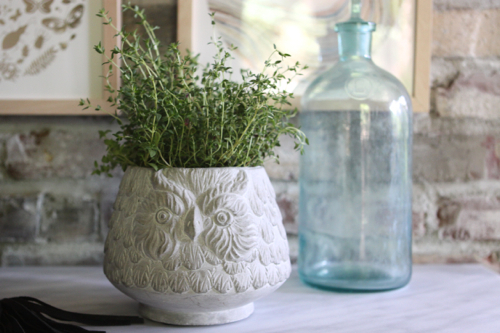 Also, how about the owl planter? West Elm, also? 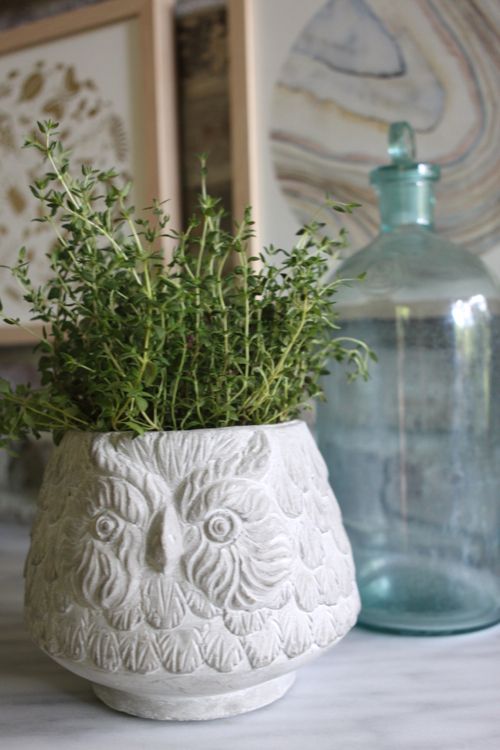 The owl planter I found at Marshalls. The duck is brilliant…..love the whole thing. LOVE THOSE FLAGS! For obvious reasons! I really love all of the pictures, but a neutral background with a crisp flag gets me every time! I love a neutral space you can change up so easily. This looks beautiful! 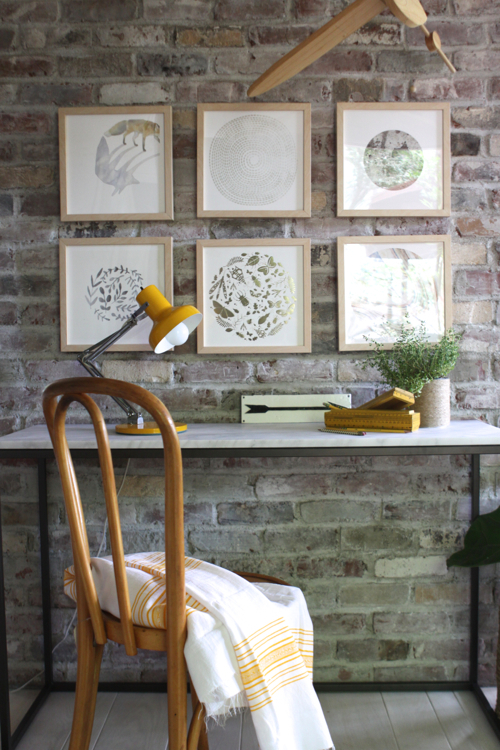 Can you please share your process for hanging the art on brick? You bet! Do you remember my post on Sugru? That’s what I used! It can’t carry a ton of weight, but it’s fine with something this size. 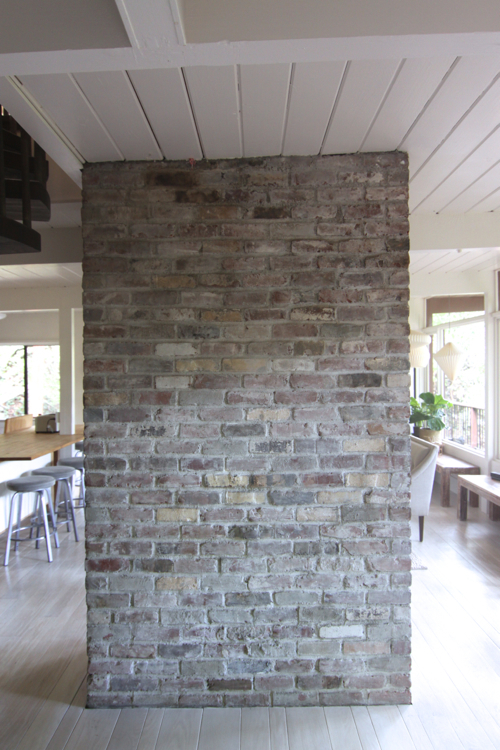 1) I measured and put a mark on the brick with pencil were the hooks needed to go (that’s the longest part of the jobl). 2) I used a pea size bit of Sugru and smeared it on each spot, then let it dry. You can read about the smearing technique here. If you’re working with a porous material it’s essential. 3) Once the smear was dry, I took a larger piece of Sugru — about a third of a packet — and attached it to the smear in a big lump. 4) Next, I took traditional picture hanging hooks and pressed them into the Sugru lumps. I used a level to make sure all the hooks aligned. 5) Then, I waited 24 hours for the Sugru to set, and hung the frames (our Minted frames came with hanging wires across the back, but if they didn’t I might have needed another technique). Thank you, Anna. I sure love our floors. I’m very impressed – this is so lovely! I love the neutral combo – so soothing and happy. Minted is fantastic – I’m going to enter now, I have a huge wall in our finished basement that I need massive help with, and $350 could go far! Wow, looks stunning! Especially first style with the typewriter, and the yellow one too. 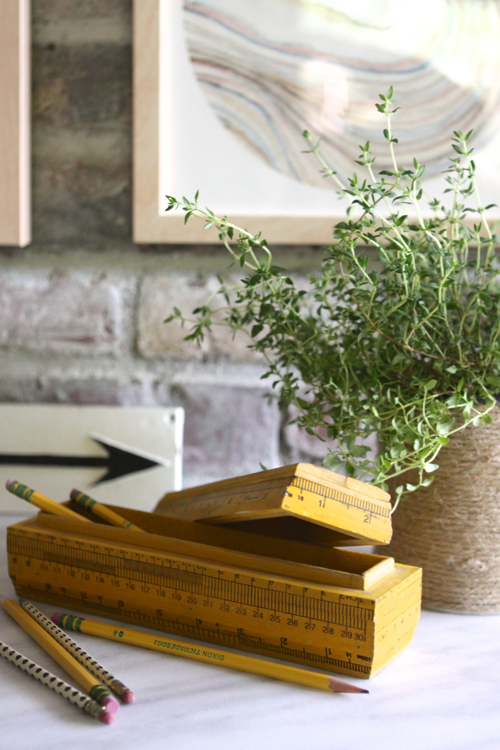 Can you please tell me, where did you get that wooden pencil box? It looks so awesome!